Villa Oleandro is situated at the end of Villa Rosa promenade in a quiet area on the border with Alba Adriatica, one of the most visited holiday resort. The villa is a few meters away from the sandy beach which is part of the famous Silver Beach in Alba Adriatica. Villa Oleandro setting gives you the opportunity to spend a relaxed and a quiet holiday. 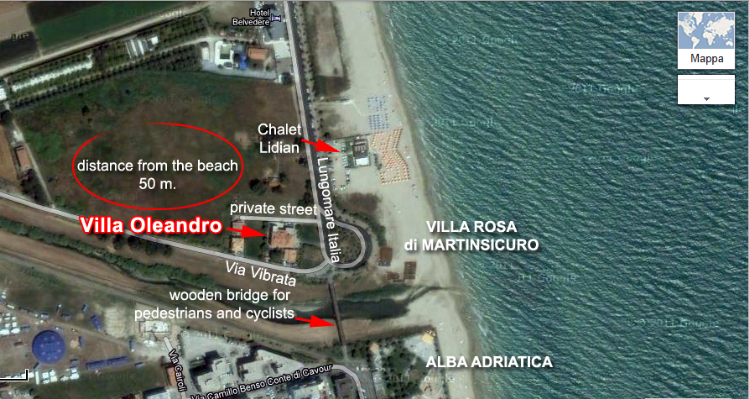 You also have the possibility to reach Alba Adriatica in few minutes, just crossing the wooden bridge near the Villa. Once arrived you can find stores, newsagents, pubs and restaurants. The area is surrounded by characteristics little villages and it gives you the opportunity to have wonderful trips around there.